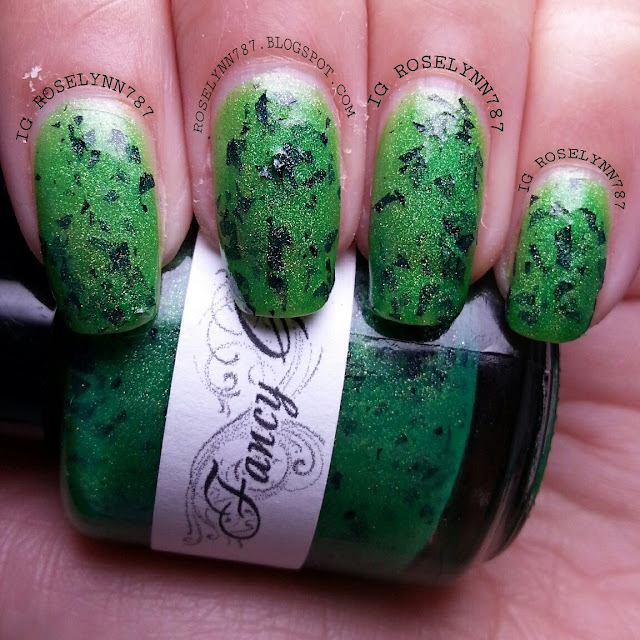 A new indie on the block is Fancy Gloss by Jackie18g. I'm a big fan of Jackie's, so when she released her own indie brand I knew right away I wanted to give it a try. The Halloween Collection by Fancy Gloss is chic and the candy-munching holiday is very well represented. 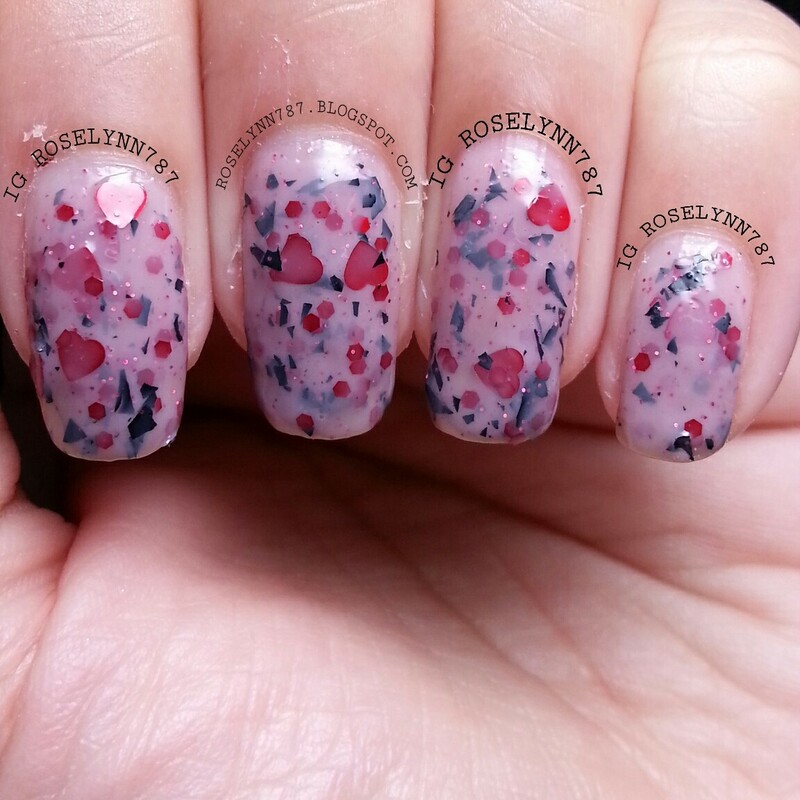 First up we have Vampire Love, a grey/reddish sheer polish filled with red hexes and black shredded glitters, as well as red heart glitters. This polish is sheer in one coat and opaque in about 3-4 coats. In this swatch, I used a total of three coats and a topcoat. With all these amazing glitters in the bottle, you'll be happy to know that there is no fishing for glitters. Not even the heart-shaped ones! You do have to be very careful though, too many layers will make your glitters start to clump. If you want to achieve a more opaque feel, then I'd definitely suggest using a solid base. One other thing I do have to mention about this polish...the combination of glitters on the nail really makes me think of blood! The name suits this beauty very well. Next we have Wicked Witch, a light green crelly filled with black, purple, and green hexes as well as shiny micro glitters. For my swatch, I used two thin coats and a thick topcoat. To achieve full opacity, you'll want to apply at least two coats. 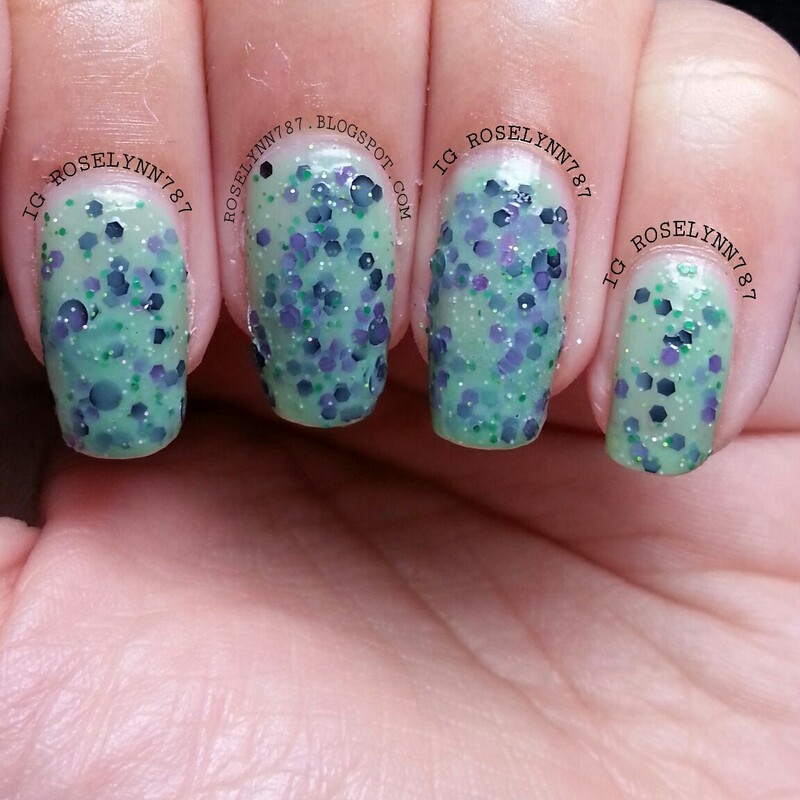 The micro glitters are a really nice touch to this polish to make it stand out. One thing I didn't care for about this polish was the brush in the bottle. It was a little wonky, but it did not effect the application too much. Not to mention that the overall combination makes me think of witch warts/skin! 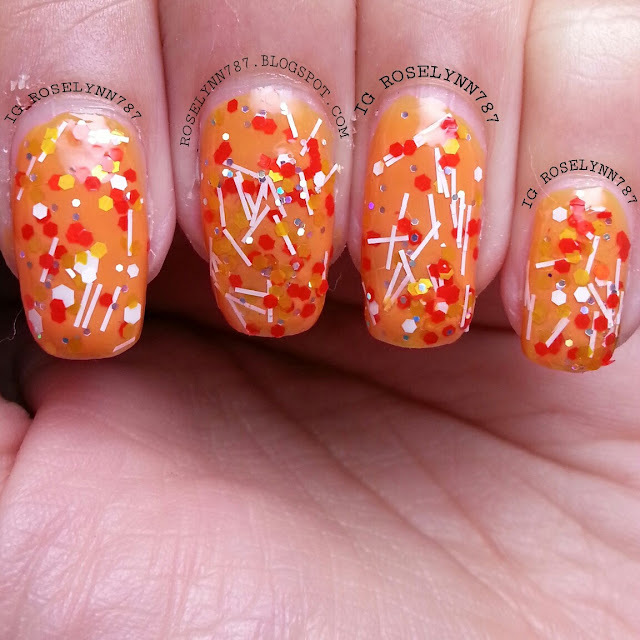 Next we have, Candy Corn Remix, a clear based glitter bomb of orange, yellow, and white hexes mixed with white shredded bars. 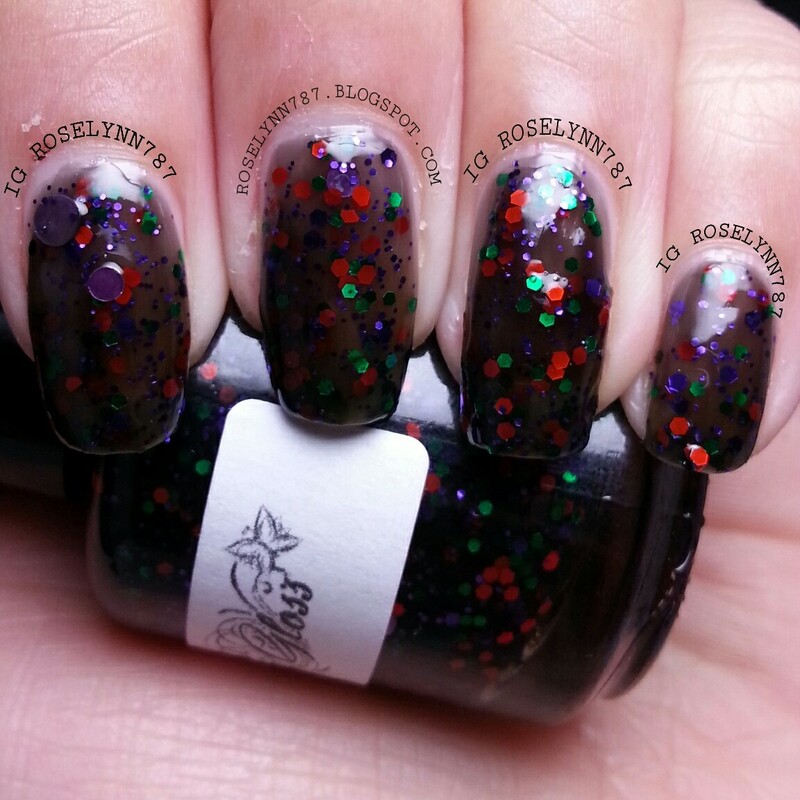 Glitters lovers run, don't walk, and get your pretty little nails on this polish. I absolutely love this one! 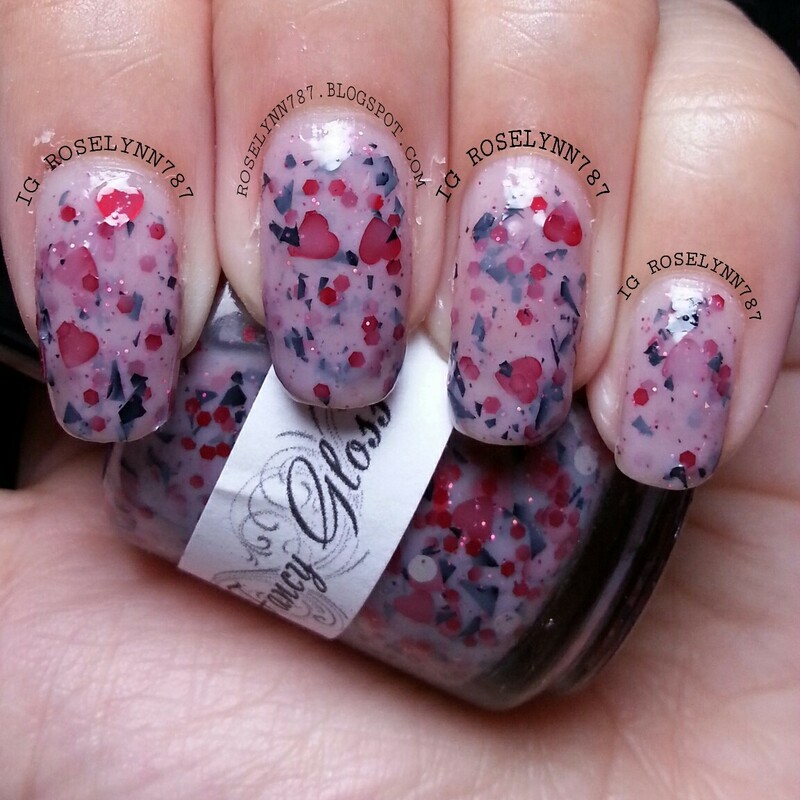 Another beauty in this collection filled with micro glitters to add the finishing touch of 'Oh La La'. I layered three coats of this polish over 'Crush On You' by Orly and finished it with a topcoat. 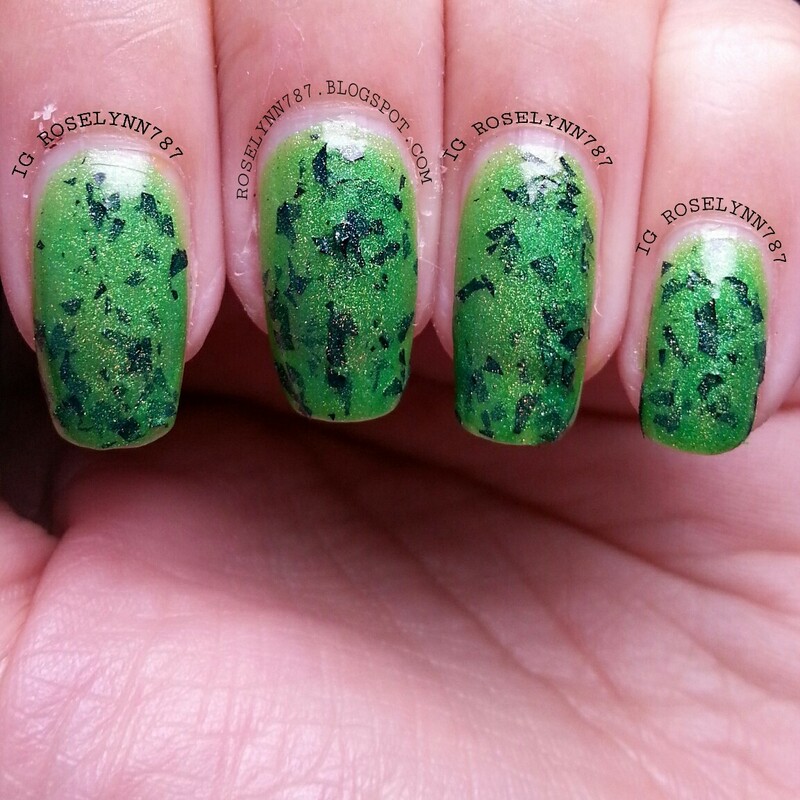 Goosebumps, is the next up in this collection, it's a lovely green polish with a slight holo finish and filled with black shredded glitter. First off, how can I not want pull out a copy of a R. L. Stine book right now! 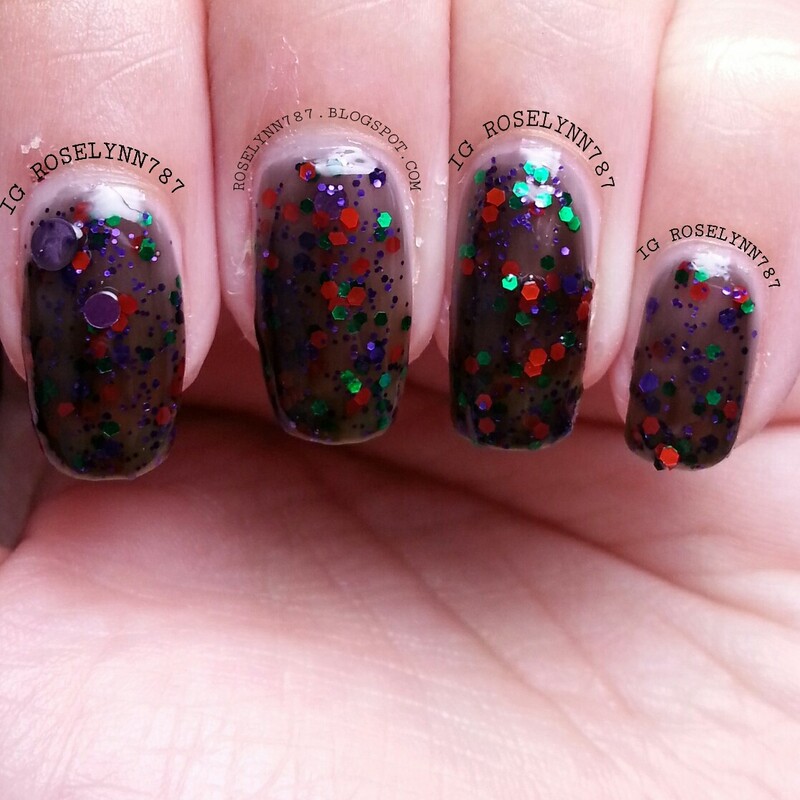 I love the combination of the holo and the glitters in this beauty. The mixture and the color make it almost feel like it's a texture polish. Goosebumps really is the perfect name! Frankie's Dream, is the last in the collection, and it's a black jelly filled with green, red, and purple hexes. What's Halloween without some black polish! I used two layers, no base, and a topcoat. I do recommend using a base if you're looking for a more opaque look. Otherwise you'll end up with too many layers and cause a glitter cluster. Although I do like this polish, it's definitely the least appealing to me from the collection. 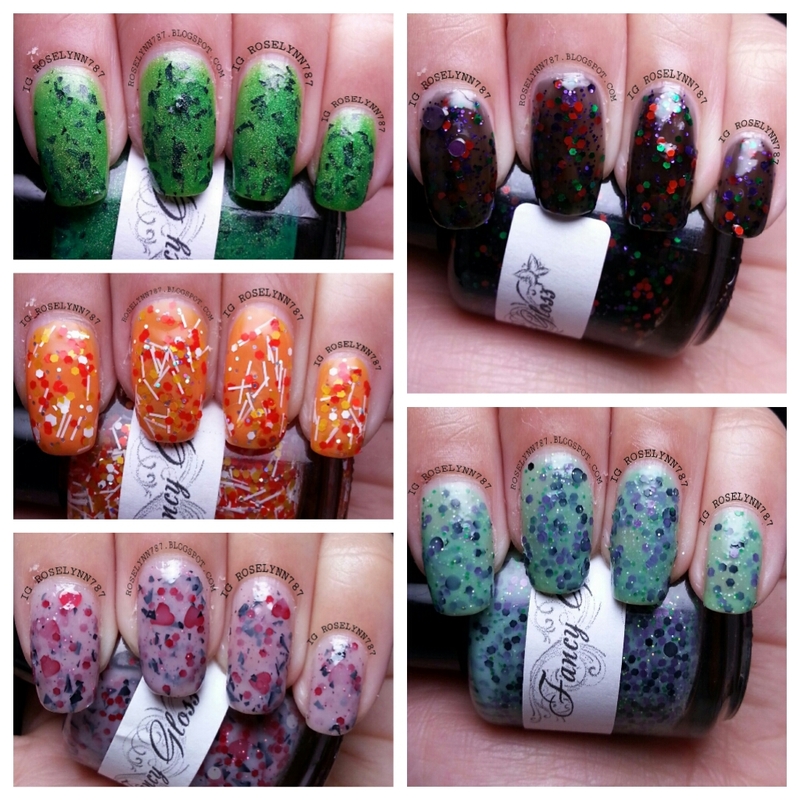 Overall I'm impressed with the Halloween collection from Fancy Gloss. I felt like every one of these creations were very well made and fit their individual names so perfectly. 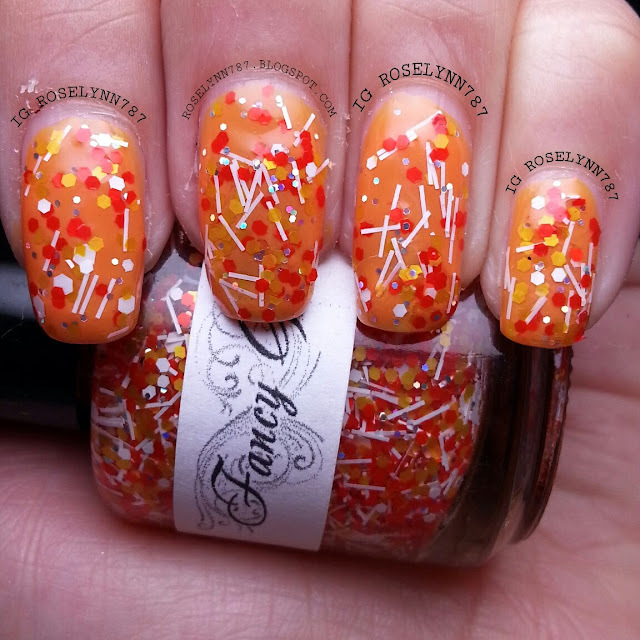 Very good creative process with the use of glitter combinations to make each polish stand out in various ways. All the polishes have a very smooth application and no glitter fishing whatsoever. I was only disappointed in the brush quality of one the polishes, as I mentioned before, and luckily the rest were fine. I would definitely recommend this collection as a must have for this Halloween. Fancy Gloss's Halloween Collection will be officially released on Friday September 13th. These are limited edition polishes so make sure you guys head over and grab yours while supplies last.